Drake has had some of the biggest hits of the last year and “Hotline Bling” was one of the biggest. Known not only for its catchy lyrics but for Drakes dancing in the video. This baby bib is perfect for any music fan or that unique couple who like a little something different. Featuring a cartoon image of Drake doing his famous dance from the video, a pink back ground with white lettering "1-800-HOTLINEBLING", accented with a black and white cross grain print. Made with fabric designed by Katie_starr on Spoonflower.com, bamboo blend quilters batting and plastic Kam snaps. 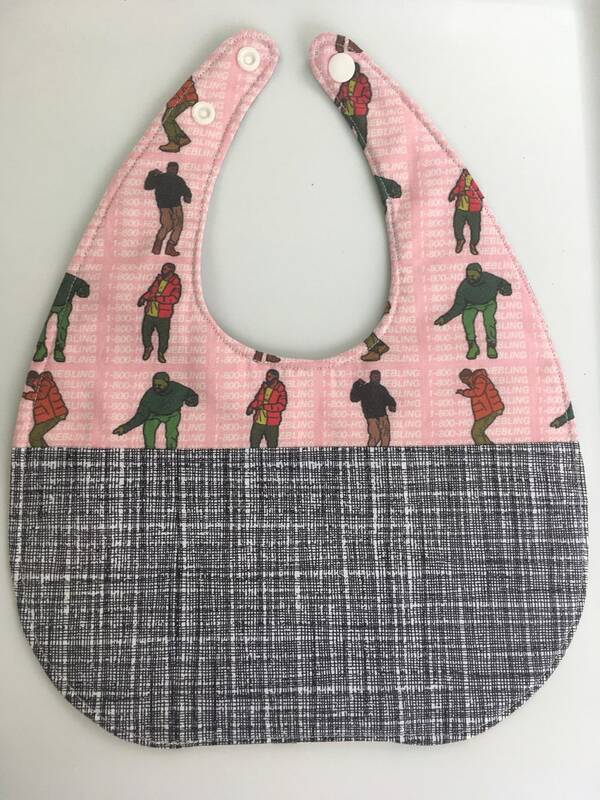 This bib is very absorbent, adjustable to grow with baby and reversible. • The design may be slightly different on each bib. Fabrics are all printed and cut slightly different from each other. If you need something specific on your bib please contact me before ordering.